It's important that you keep your baby's smile and take good care of their teeth and gums. With The First Years Grow with Oral Care you can maintain a healthy 'Hi' and a Shining smile protecting both the white enamal, the gums and the cleanliness of your baby's toothbrush. 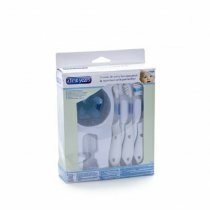 As an Officially licensed product of the American Red Cross, we highly recommend Grow with Oral Care for the protection and development of your baby's teeth and gums.1 fingertip toothbrush.